1. Students will take a MIDTERM EXAM for the EXCEL unit. 2. Students will complete and graph their DATA from the senses experiment. 1. If I wanted to multiply A3 with C3, what formula would I type? 3. Which is the correct formula for adding a Column: =SUM(A3:A12) or =(A3:A12)? 4. When should you use the word "SUM" in your formula? 5. If tax is 10.25%, write a formula that would figure out the tax for a subtotal of $23.95 that is in CELL D16? 6. What company makes EXCEL? 7. What is a Spreadsheet? 8. On Excel, make a quick Reciept for these 2 items. YOU DON'T NEED TO SHOW THIS TO ME FOR CREDIT, just write your answers on BLOGGER. 1 Box of Tissues ($1.59 EACH) and 2 Toothbrushes ($2.59 Each). Figure out SUBTOTAL, TAX (9.25%), and GRANDTOTAL. - What is the SUBTOTAL? - What is the TAX? - What is the GRANDTOTAL? 1. Students will graph various DATA using the graph tool on MS Excel. 1. Tell me what you need to give excel in order to graph? 1. Students will use appropriate formulas and by adjust cell properties by creating a simple Grocery Receipt. 2. Students will graph various DATA using the graph tool on MS Excel. First, Click, Save As and Open is file. Complete the Digital Zen instructions on the EXCEL spreadsheet. 1. Students will use appropriate formulas to add, subtract, multiply, and divide. 2. 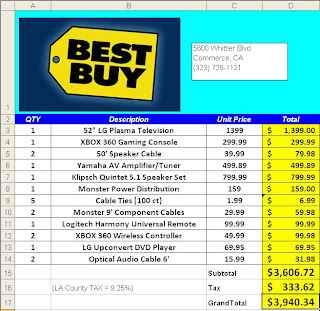 Students will use appropriate formulas on Excel to create a Receipt budget for a dinner party. 2. Write a formula that would sum A1:A20. 3. Application: Creating a Receipt. Column F: Add the Totals of each ROW here. 1. Write a 4 formulas to add, subtract, multiply and divide 6 and 3. 1. Students will user the appropriate formulas to add, multiply, and divide math problems on MS Excel. 2. Change the size of Column A to fit your name. 2. Students will user the appropriate formulas to add, multiply, and divide math problems on MS Excel.